Release: 2018 | Pre-order now available! Get your copy at the special price of $2.99 before release. 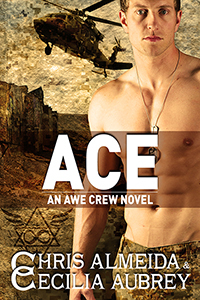 Lieutenant Cameron Acer is an expert sniper and an indispensable member of the elite Special Operations team called The AWE Crew. He’s invested a decade of his life into a cause very close to his heart. Now, an injury sustained during a high-profile mission may prevent him from returning to the job he loves. Quitting is not an option. His only hope lies with his physiotherapist, Olivia Dawson, an expert in virtual reality-augmented rehabilitation, whose gentle hands soothe more than just his wounded body. Olivia had once relished helping brave men and women achieve the independence they need to reintegrate into society until a tragedy led to a change of heart. Forced to take Cameron’s case just as she’s leaving her job at the military hospital, she sets her core beliefs aside to help the soldier return to his team. What begins as a simple patient-therapist collaboration morphs into something deeper than neither of them wants or is prepared to handle until a clear and present danger threatens Olivia’s life. Will this shocking turn of events compel them to face their fears and allow them a chance at a future together?